Here are some snazzy birthday facts about 29th of June 1992 that no one tells you about. Don’t wait a minute longer and jump in using the content links below. Average read time of 10 minutes. Enjoy! What day was my birthday Jun 29, 1992? June 29, 1992 was a Monday and it was the 181st day of the year 1992. It was the 26th Monday of that year. The next time you can reuse your old 1992 calendar will be in 2020. Both calendars will be exactly the same! This is assuming you are not interested in the dates for Easter and other irregular holidays that are based on a lunisolar calendar. There are 68 days left before your next birthday. You will be 27 years old when that day comes. There have been 9,793 days from the day you were born up to today. If you’ve been sleeping 8 hours daily since birth, then you have slept a total of 3,264 days or 8.94 years. You spent 33% of your life sleeping. Since night and day always follow each other, there were precisely 332 full moons after you were born up to this day. How many of them did you see? The next full moon that you can see will be on May 18 at 21:13:00 GMT – Saturday. Fun stat: Your first one billion seconds (1,000,000,000) will happen sometime on March 7, 2024. If a dog named Reagan - a Toy Fox Terrier breed, was born on the same date as you then it will be 124 dog years old today. A dog’s first human year is equal to 15 dog years. Dogs age differently depending on breed and size. When you reach the age of 6 Reagan will be 40 dog years old. From that point forward a small-sized dog like Reagan will age 4 dog years for every human year. Father Francisco Palou founds Mission San Francisco de Asís in what is now San Francisco. Russo-Turkish War: Admiral Dmitry Senyavin destroys the Ottoman fleet in the Battle of Athos. France grants 1 km² at Vimy Ridge “freely, and for all time, to the Government of Canada, the free use of the land exempt from all taxes”. What does my birthday June 29, 1992 mean? 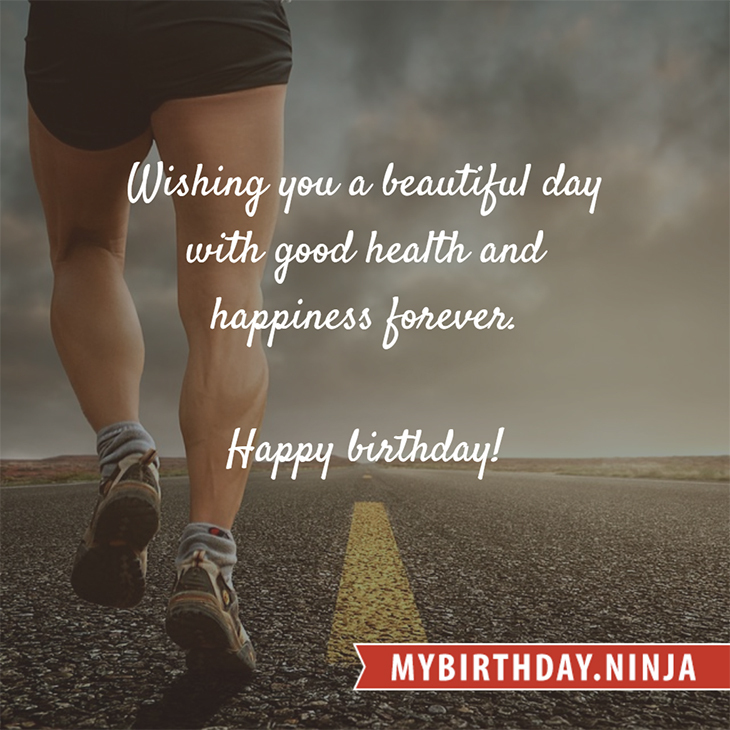 Your birthday numbers 6, 29, and 1992 reveal that your Life Path number is 2. It represents balance, harmony and partnership. You have the soul of an artist. You are a fine companion and possess a good sense of humor. Friends seek you out for your calming and peaceful company. The following celebrities also have the same life path number: Rona Anderson, Kevin McDonald, Colm Wilkinson, Aftab Shivdasani, Theresa Merritt, Brook Silva-Braga, William Asher, James Marsden, Diana DeGarmo, Thomas Mitchell. 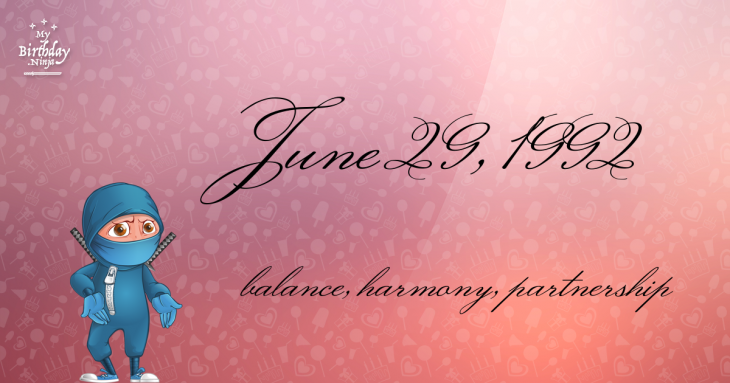 What is the birthday horoscope for Jun 29, 1992? The Western zodiac or sun sign of a person born on June 29 is Cancer ♋ (The Crab) – a cardinal sign with Water as Western element. The ruling planet is Moon – the celestial body of moods and emotions. According to the ancient art of Chinese astrology (or Eastern zodiac), Monkey is the mythical animal and Water is the Eastern element of a person born on June 29, 1992. Fun fact: The birth flower for 29th June 1992 is Rose for devotion. What is the Love Match for Jun 29, 1992? When it comes to love and relationship, you are most compatible with a person born on March 3, 1965. You have a Love Match compatibility score of +219. Imagine being in love with your soul mate. On the negative side, you are most incompatible with a person born on July 18, 1997. Your incompatibility score is -148. You’ll be like a cat and a dog on a love-hate relationship. Arf-arf, I want to bite you. Meow-meow, stay away from me! I do not know how you feel about this, but you were a male ♂ in your last earthly incarnation. You were born somewhere around the territory of Austria approximately on 1525. Your profession was entertainer, musician, poet, temple-dancer. How many babies were born on June 29, 1992? Base on the data published by the United Nations Population Division, an estimated 135,687,063 babies were born throughout the world in the year 1992. The estimated number of babies born on 29th June 1992 is 370,730. That’s equivalent to 257 babies every minute. Try to imagine if all of them are crying at the same time. What is the popular baby name on 29 Jun 1992? Here’s a quick list of all the fun birthday facts about June 29, 1992. Celebrities, famous birthdays, historical events, and past life were excluded. Try another birth date of someone you know or try the birthday of these celebrities: May 14, 1993 – Miranda Cosgrove, American actress and singer; December 17, 1939 – Eddie Kendricks, American singer-songwriter (The Temptations) (d. 1992); December 25, 1907 – Cab Calloway, American singer-songwriter and bandleader (The Cab Calloway Orchestra) (d. 1994).